Relax in traditional style with this elegantly styled chair. Split seat back, scooped rolled arms, and turned feet all work together to create a classy look ideal for your home. Graceful welting and nail head trim play handsomely with the arched camel chair back that gives it chic height and class. The motorized recline mechanism makes for amazing comfort and the perfect place to watch TV or read a book. 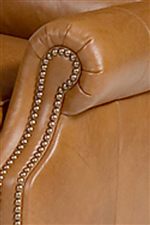 Choose from a variety of leathers or over 8oo fabrics for a look that is perfect for your home. The 705L Motorized Reclining Chair with Rolled Arms by Smith Brothers at Saugerties Furniture Mart in the Poughkeepsie, Kingston, and Albany, New York area. Product availability may vary. Contact us for the most current availability on this product.